There aren’t too many books I’ll purchase sight unseen. I like to get my hands on them, flip through them, read some random pages, you know – give books a good once over, just to be sure. But if a book has Mo Willems’ name on the cover, all bets are off. He’s earned it. Or maybe the pigeon has. Possibly Elephant and Piggie. And that’s how Big Frog Can’t Fit In arrived on my doorstep yesterday. There was no disappointment. As a story, there’s not too much here. Big Frog is big. Too big for her book. She’s not short enough or bendable enough and, frankly, “Big Frog can’t stand it!” But Big Frog has friends, and friends are good at helping solve problems. When a big number of little friends come to Big Frog’s aid, a solution is quickly discovered. The magic of the book is the pop-ups, or more accurately, pop-outs as the book proclaims. The book even gives a large print shout out to Bruce Foster for his paper engineering, referring to him in one spot as Big Bad Bruce Foster. Big Frog sticks her tongue out to proclaim her feelings about not fitting in. She dreams of shrinking or bending around into a pretzel-ish knot and folds her arms in disgust. Big Frog’s friends even appear out of nowhere to help. My only concern is that it’s a pop-up – eh-hem, pop-out book. As a kid I had a Star Wars pop-up book. I was extremely frustrated when Luke couldn’t rescue Princess Leia anymore and when Obi-Wan Kenobi battled Darth Vader but he wouldn’t die because the flip wouldn’t flop. (Maybe I was a bit rough on my pop-up books, but hey, I was a kid!) The pop-outs in Big Frog Can’t Fit In are extremely intricate. That’s what makes the book so cool. Hopefully Big Frog’s friends are always able to come to his rescue, that the pop-outs don’t prevent their friendly assistance. 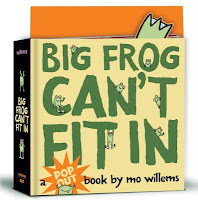 Despite my childhood history with pop-up books, Big Frog Can’t Fit In is getting my highest recommendation. Hopefully Big Frog can fit on bookshelves. A lot of them. Wilson loves school. The main reason? Miss Lovely. After only one week of school, Wilson already knows it’s the place for him. All he can think about is, “Miss Lovely! Miss Lovely! Miss Lovely!” He’s too excited to sleep and too excited to stay in bed one minute more. He’s up early – washed, dressed, and fully fed – all by himself. But he’s not the only one up early. As Wilson prepares for his next day of school, readers look behind a foldout page to see the other early riser. (Or just a part, anyway.) One foot, green, possibly scaly, certainly large, with three sharp claws, taking one step closer to Wilson. Wilson leaves for the bus, only to find the world quietly deserted. There’s no one at the bus stop, and no bus arrives. Why is he alone? Only we readers know better. He is not alone. Another fold out reveals one long tail, definitely scaly, green, with spikes all the way to its tippy-tip. Wilson runs to school to find all the busses neatly lined up as if they’ve already dropped off their students, but no students. The hallways are deserted. The classrooms and desks are all empty. No one but Wilson is present. Something is wrong, he thinks. “And somewhere, not so very far away at all, something was approaching. Nearer, nearer, nearer it came!” we read in the next foldout. 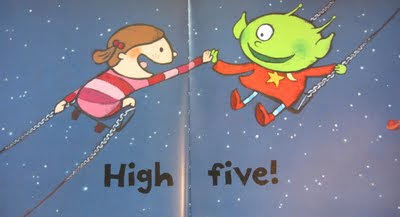 This time it’s a hand, again it’s green, with webbed fingers and sharp, pointy claws wiggling menacingly. Wilson continues throughout his day alone. He does the lessons. He goes to recess. He even sends himself to the principal’s office when his behavior becomes unruly. And all the while, the mysterious stalker closes in. Kids will have number of reactions to John Stadler’s back-to-school mystery. Some will wonder why there’s nobody at school. Some will guess the real reason. 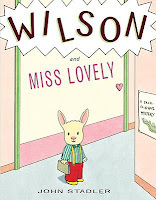 Some, however – the kids like me – will guess it’s because the monster stalking Wilson has already devoured the other unsuspecting bunnies and is about to finish the job by finishing Wilson. But all readers, even the most morbid among us, will be surprised by the ending, just as Wilson is surprised to finally see Miss Lovely. A great big thank you to everyone who attended my sectionals at the Arkansas Reading Recovery & Comprehensive Literacy K-8 Conference. Everyone in Little Rock was extremely welcoming and supportive. And a special thanks to Carla and Stephanie who, a year and a half ago, thought it would be a good idea to ask "Brian in the Back" to present at their fall conference. Thanks! Or, if you are missing just a recommended book list, you can scroll through the site by grade level. I'm not exactly sure if all the titles on the book lists appear on the site, but if I feel a book is recommend-able, chances are I've added it here or will soon. And finally, I'd love to hear from more of you. If there was something you especially liked or disliked, questions you have, or anything else, let me know. Feel free to leave a comment at the bottom of this post or send me an email. Thanks again! If a book immediately connects to the kid reading it, or to the adult reading it to the kid, or the kid to whom the adult is reading, or to the sibling on the other side of the room while the book is being read to a younger sibling, or the grandparent who … well, you get the picture. If the book makes a connection, chances are it’s going to be a winner. For us it happened when Little Pea hollered, “Again! Again!" It happened when the boy realized, “Papa’s got a Stormy Kromer!” when reading Stormy’s Hat. It happened with Make Way for Ducklings when we actually met the ducklings. 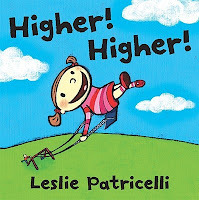 And it happened again with Leslie Patricelli's Higher! Higher!. What child doesn’t scream, “Higher! Higher!” when being pushed on the swings? Ours sure did. I remember shouting the exact same thing when I was but a wee-one, but my imagination is apparently much Lower! Lower! than the young lady’s in the book. I always thought a loop-the-loop around the swing set bar would be cool. But to swing as high as a giraffe? To the tops of buildings? To mountain peaks? Past airplanes and the atmosphere? That’s some serious swinging! Swinging of this magnitude is, according to the text, not exclusive to Earth. If there is life on other planets, then it stands to reason that extra-terrestrial toddlers would also love swinging higher and higher. And if two simultaneous swingers were to meet at their highest point, what would they do? New column in the local paper today in which I admit my ignorance and share the steps taken towards gaining the proper educaton. But really, how can fathers know all there is to know about daughters? Read about it here or print it out here. Thanks for visiting. No, Mr. Atlas didn’t get my $0.10. Strong Man: The Story of Charles Atlas begins with the arrival of Angelo Siciliano at Ellis Island. It describes his tough Brooklyn neighborhood and a beating he took from a local bully. Then readers are presented with the scene made famous in the comics. Sand is kicked in Angelo’s face at the beach, humiliating him in front of his date. I always thought the event was fiction, created simply to separate young 97-pound runts around the country from their dimes, but apparently it’s real. 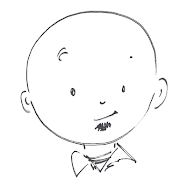 Nevertheless, it’s the event that changed Angelo Siciliano into Charles Atlas. Charles Atlas’s fitness course encouraged more than physical strength. Charles encouraged youngsters to eat right and clean their rooms and not to laze about in bed. (Hmmm … I wonder where Hulk Hogan, 1980’s WWF icon, got his famous, “Train, say your prayers, eat your vitamins, be true to yourself, true to your country, and be a real American!”?) Charles had a passion for fitness, that’s obvious, but also encouraged others, both kids and adults alike, to “take charge of your life." Strong Man ends with suggested exercises for kids and a note for parents about the importance of activity in children’s lives. The author’s note gives more detail about Atlas’s life, including how he modeled what he preached, but also asks the question, “Who really was Charles Atlas?” What’s myth? What’s reality? How much of the Charles Atlas legend is based on fact and how much has it been exaggerated or embellished? 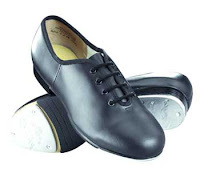 No reading of Meghan McCarthy’s book would be complete without looking at the original ads. The whole thing – comic books, “97 pound runt,” 32 page illustrated book, change-your-life-all-for-just-ten-cents – appears at first glance to be a plot for one man to get rich quick, one dime at a time. 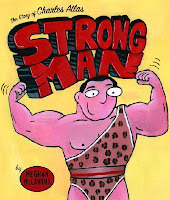 But Strong Man lets readers learn the story behind the bulges.